SIGNED BY THE AUTHORS! - buy 2 or more and save $10! ***All sales are matched 100% as donations to GeneralNeeds.org - providing goods and services to needy Veterans. The rich, colorful history of Aston Martin has many high points – on the race track, on city streets, even on the silver screen – but the true measure of success of any auto maker is the connection that exists between the cars and their devoted owners. 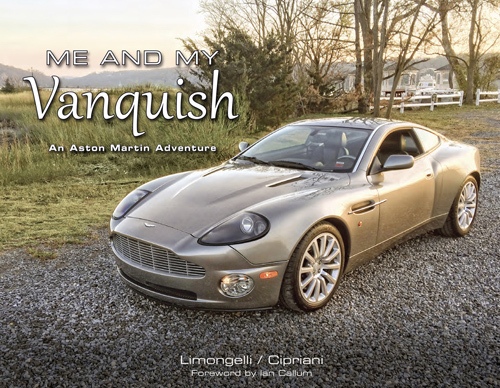 This book follows Joe Limongelli’s experiences as an enthusiast and owner of several notable Aston Martin cars, detailing the finer points of purchase, care and maintenance of a specialty vehicle and culminating in a remarkable adventure – a journey across the United States in a 2004 Aston Martin Vanquish. A road trip unparalleled, in a car equally as unique. Join us in a celebration of one of the most legendary British sports cars as told by the owners who make Aston Martin a way of life.